[miau] Although not open to USA players, Kerching Casino Slots are available on both PC and mobile devices with the latest internet casino slots. It offers gaming technology from IGT (International Game Technology), a world leading slots software developer, who is reputed to have superior technology and who won the 1989 U. S. Senate Productivity Award. IGT online casino software offers more than 80 different slot titles which are updated regularly for delivery of the latest games in the market trends. There is a link on the page that points citizens of the USA to other slots games. 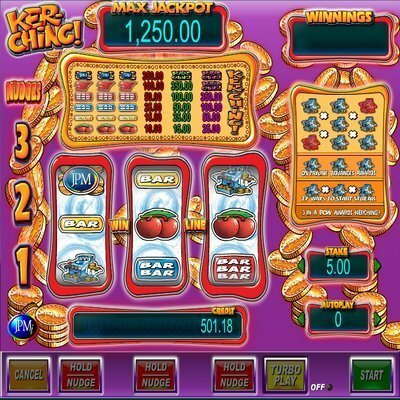 Kerching Casino offers classic slots like 3-reel and 5-reel slots, as well as jackpot slots. You will fine online versions of Monopoly, with Pass Go Bonus, and Cleopatra. The latest slots include Da Vinci Diamonds, Dungeons and Dragon, and Battleship-Search and Destroy. Kerching Casino offer free play options which allows you to play before depositing money to play for the cash prizes. Free slots allows you to play classics as well as new titles. Online slot games feed into one huge progressive slot jackpot, known as Mega Jackpots where you can win millions of dollars by landing five Mega Jackpot symbols in the middle pay line on a maximum bet spin on any of the games included in the progressive slot games. Many casinos feed into the Mega Jackpot and if you win you can receive 20 yearly installments with the first paid immediately, or receive a lump sum that is equal to the 20 annual payments. These Mega Jackpot slots are Monopoly, Cluedo, and Cleopatra. Kerching Casino also offers licensed slot games including Ghostbusters, Monopoly Plus, Star Trek Against All Odds, Cluedo-Who Won It, Battleship Search and Destroy, Transformers: Ultimate Payback, Monopoly Pass Go, Monopoly Multiplier, Monopoly Here and Now, Jeopardy!, Wheel of Fortune Triple Action Frenzy, and Wheel of Fortune Hollywood. Kerching Casino has 5-reel video slot including: Cleopatra, Cleopatra 2, Da Vinci Diamonds, Enchanted Unicorn, Kitty Glitter, Treasure of Troy, Wolf Run, and Transformers Ultimate Payback. These games offer more than just the slot experience. For instance, Transformer Ultimate Payback also offers the opportunity for players to bet on which set of robots will win the battle. You must be register for a cash prize play to win a payout. Da Vinci Diamonds also has a unique feature that allows a player to win multiple times from a single spin. Cleopatra 2 offers great payouts because it has 5 reels with 20 pay lines and spins multipliers up to 50 times. Their selection of 3-reel slots include Arabian Riches, 3-Reel Hold, Elvis-A Little More Action, and Vegas Baby! These slot games are simple to play. Altogether, Kerching Casino offers over 60 online slot games and first time deposit bonus of 100%. You can download and play on your iPad, iPhone, and Android. It also offers instant play and downloads on your PC. Other games Kerching Casino offer include video poker, blackjack and roulette. The free play provided by IGT online slot machines offer over 80 different slot titles. Everyone except USA residents are sure to have a great slotting experience whether playing free and betting to cash in on a big payout.